The climate of Okinawa is sub-tropical, with very mild winters, and long, moist and rainy summers. 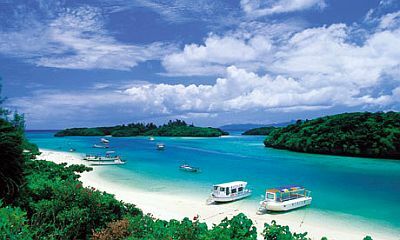 Okinawa is an archipelago, which includes the main island of the same name and some smaller islands (Kumejima, Agunijima, Iejima etc.). The nearby archipelagos of Kerama, Daito and Iheya have a similar climate. Here are the average temperatures in the capital, Naha. Although the winter is very mild, the sky is often cloudy, and periods of bad weather, with wind and rain, are quite common. Sometimes, especially in January and February, there may be very cool or slightly cold days, with maximum temperatures around 15 °C (59 °F) or below, and minimum temperatures around 10 °C (50 °F) or below. The long summer is muggy, with fairly frequent, and sometimes abundant rains. The first part of the rainy season, called the plum rains (Baiu), arrives one month earlier than on the main islands of Japan, so it occurs in May and June: not only the rains are frequent, but also the sun is seen quite rarely. In July, there is a relative pause, in fact the rains decrease and sunshine becomes pretty frequent (although this does not happen every year, for example, in the year 2015, June has been quite dry while July has been very rainy). In the second part of summer (August, September and early October), the rains increase again, but the amount of sunshine is generally decent, and certainly better than in May and June. From June to October, with a maximum from August to early October, Okinawa can be affected by typhoons, the tropical cyclones of Southeast Asia. Of the 26 typhoons that form on average every year in the northwest Pacific, 3 or 4 pass close enough to Okinawa to threaten it or at least to have an impact on the weather. On September 22, 1999, the island was hit by Super Typhoon Bart, which unloaded 700 millimeters (27.5 inches) of rain in two days and caused severe damage due to high winds. 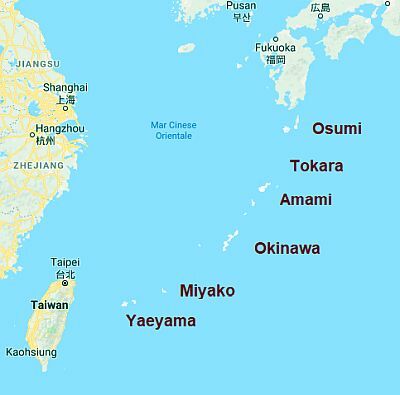 The sea in Okinawa is never cold, in fact the temperature drops to a minimum of 22 °C (72 °F) in February and March, while it gets very warm in summer. The cherry blossoming in Okinawa occurs as early as in winter and is longer than on the main islands of Japan: two or three weeks pass from the beginning to full flowering (which occurs on average around February 1st).